Sometime last evening I went over the hump. It's all down hill from here until Friday, which is the first day of my weekend. Since nobody hated my little confetti shooting picture yesterday, I may have to look for something else to shoot out confetti. So, is everybody else simply amazed that the Idiot Jerk in the White House is driving the white Republican party straight for the white supremacist cliff? Of course, we always knew he was stupid, vicious man, but what he's doing now is pretty much the same thing as a pre-autopsy. Not that there was much life left in his base, but he does seem hell bent on cutting them open and showing all the dirty bits that are inside. I know there are a small few out there who think Kirstjen Nielsen was the worst thing to happen to immigrant children... just wait until the Idiot Jerk puts in one of his White Supremacist lackies. He's also going to put one of them in charge of the Secret Service. This is what the Republican Party has wanted since that schmutz Reagan won by a landslide: a dictator. They have no problem if he's a white supremacist since their party is almost entirely white. Unfortunately for the party, and the wannabe dictator, they are a minority group that's part of what will soon be a minority group (white people) because of evolution. This is how the world turns, how change happens. Anyway, we're supposed to have another warm one today, up around 75 (F). That's fine with me. Oh, sure, it's going to cool off with a possible thunderstorm this evening. This is life, too. I wanted to purchase some seed packets yesterday, but ended up leaving them at the flooring desk. I actually ended up getting overtime. I hate overtime. Normally I will head back to the time clock a bit early but yesterday I had to cut some blinds. He wanted 5 - we only had 4. He asked if we "had more back in the warehouse." I very politely told him we do not have a "warehouse." In modern retail, you do not store up additional stock in your warehouse. There is an algorithm which calculates how many blinds we need to keep on hand based on the frequency with which they sell. Once the count gets too low, they are automatically reordered. This is how retail works. 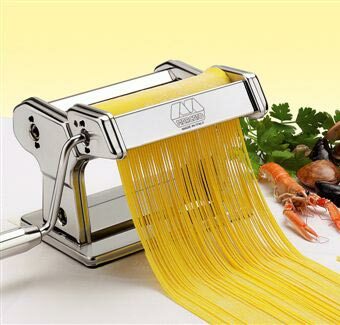 And, since I'm off on Friday I'm going to whip out the new pasta maker and crank out some fettuccine. If everything works well, I might take a picture and shoot confetti all over my noodles. Now, doesn't that sound exciting? I have an apple peeler and an "as seen on t.v." sock putter onner for folks with decrepit hands. It's been over a year and they're still in their boxes. Procrastination rears its ugly head once again! Enjoy your pasta making. _____ has been a racist his whole life, even in business, so why anyone is surprised by him is stunning. What's a somewhat surprising, and only somewhat, is that Republicans are lining up behind him... of course, we always knew the were racist. stephen miller is filling the DHS and SS with nazis. who the hell elected stephen miller anyway? I would love to try some of your pasta. Sorry, what was that thing about the confetti, there's something in my eye... must be a spare noodle. I have never made pasta from scratch. I hear that there is nothing like it! I will find out on Friday and let you know.